About a month ago, I got a bad case of 'Brooklyn Tweed Envy' - specifically, his knit version of the Noro Striped Scarf (Ravelry link here; Flickr group here) - and I had to have one. 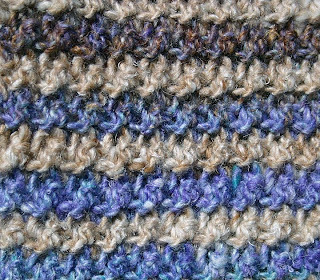 The problem was that if I knit it, I'd still be working on it when I was old(er) and gray(er). And I wanted it NOW. The obvious solution was to make a crocheted version. I searched Ravelry and the web but couldn’t find what I wanted. 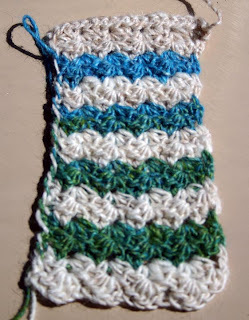 So I looked through my pattern books and swatched - front-post/back-post ribs were pretty but too stiff (the knit version is a 1x1 rib, so this was an obvious place to start); shells were too wavy - straight lines were needed here; and double or half-double crochet was too . . . crochet-looking. I don't mean that in a bad way; I just wanted a pattern that people couldn't identify at a glance. I finally came up with this design and it's exactly what I wanted. 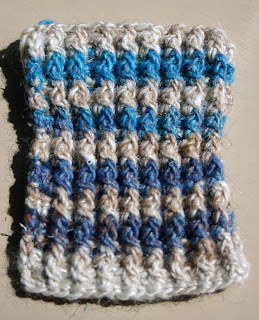 A bumpy texture to mimic the original's ribs, straight lines (but not too straight), and easy enough for a beginner, but still challenging for more advanced hookers. I'm really pleased with how it turned out. 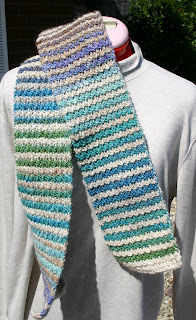 So much so, that I'm in the process of unraveling 2 old Noro scarves so I can combine them into another one of these. Stay tuned!